Paul Smyth's story goes right to the heart of the popularity of Canvey as envisaged by its early developers. The artist left numerous historical and quite atmospheric images of the island, South Benfleet and the waters hereabouts. Mainly water colours, subjects range from the Canvey village pump in 1913, through the 1920s and '30s to the early 1950s and include barges and bungalows, boats and the (then) yacht club, farms, creeks and general views. How Long Road has changed since the artist painted it in 1913. Anyone remember old Whitehead's caravan? Or Mrs Mulley's flower-covered Bungalow? It must have been the artist's mother-in-law's home. Even after the collapse of Frederick Hester's grand development plans for Canvey his spirit remained and the people kept coming. Oddly enough, what Daniel Defoe had described as a very unhealthy low area in 1722, had become a sales point, a celebration for health and ozone seekers. Paul Smyth made frequent trips to Canvey Island with his family from London dating back to 1913 and it was on Canvey Island that he met his future wife Elsie Mulley. She had moved to Canvey from Richmond, London, with her mother and sister Hilda, 'due to the healthy sea air', according to their granddaughters who have set up the site in honour of their grandfather. Their great-grandmother was Florence Mulley, who lived at 'Buccleuch' bungalow at Leigh Beck. For two or three years during the 2nd World War Florence and daughter Hilda, as well as Hilda's two children moved to the safety of Somerset, but an old postcard records Florence's longing to get back to Canvey. When she did return she moved to a bungalow on the High Street near the Admiral Jellicoe pub. 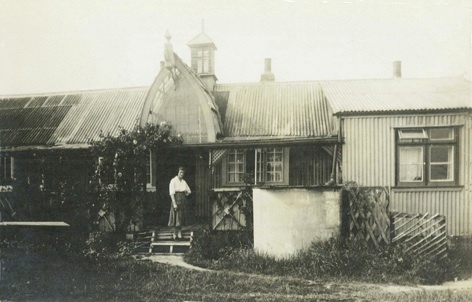 Hilda and her family moved to 'McEwan', a bungalow in Point Road opposite the bus station. Here Barbara and Sue spent two weeks every summer, coming on the steam train from Upper Holloway - the Great Event of the Year. Paul Cranfield Smyth was born in Highgate in 1883. His father was a headmaster and the boy, who displayed an aptitude for painting at an early age, became a teacher. In 1913, at the age of 30, he exhibited at the Royal Academy. It is also the year his first Canvey pictures were painted. When war broke out in 1914 he joined the 2/7th Middlesex Regiment and was sent to Gibraltar, then Egypt and in 1916 with the 19th Manchester Regiment to France and the Somme. Seriously wounded on the first day of the Battle of Passchendaele, he spent nine months in hospital. On 20th July 1918 Paul Smyth married Elsie Mulley at St. Mary's, Brookfield, Highgate. They lived in Highgate and later North Finchley, where he was a driving force behind the Finchley Art Society which he founded in 1949 and was president of for some years. Maybe there is something in that healthy Canvey air - the artist died a month before his 80th birthday. Update: Canvey-born Graham Stevens remembers Mrs Mulley from his childhood in the early 1950s. The bungalow she moved to when she returned to the island from Somerset was called 'Churchside' and stood on the corner of Gainsborough Avenue and High Street. The bungalow actually belonged to his aunt Blossom and its history goes right back to the early days of Canvey development, when the Stevens family acquired it as a holiday bungalow. Graham and his sister Jenny (now Jenny Stacey) used to run errands for Mrs Mulley, down to Beales on the corner of Seaview Road for the papers and ciggies. And sometimes they'd trundle the accumulator for her radio (anyone remember them?) on a pushchair to Valentines' Garage for a refill, not an easy task for children. The garage also had petrol pumps. As can be seen in the pictures, the lady was partial to hats and one of Graham's cherished memories is that she always wore a black boater hat with a brightly multicoloured striped hatband. 'McEwan', the bungalow her daughter Hilda and her family moved to in Point Road opposite the bus station, just like the gælic 'Buccleuch', originally had Scottish connections. This gallery was added by Robert Hallmann on 12/04/2008.